Free breakfast gets our guests up and running at the non-smoking Americas Best Value Inn - Kalispell. At this low-rise property all 53 non-smoking rooms are equipped withcable TV with HBO and spacious work desks for a productive stay. Pack the pooch as small pets are allowed. Breakfast and parking are also free. 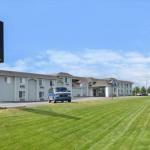 The hotel is in a prime spot for hitting Kalispell's green scene three miles from Buffalo Hill Golf Club and four miles from Village Greens Golf Course. The charming streets of architecturally rich downtown Kalispell are within a one-mile drive as is Loose Change Nickel Casino for those looking to strike it rich. Glacier Park International Airport is 10 miles away.